How does the Galaxy in which we live look like? It is almost certain that we will never be able to send a probe out of our Milky Way to take a snapshot, in the same way as the first satellites could do to give us striking images of planet Earth. But astronomers do not need this to imagine what our bigger home resembles. And they have a pretty good idea of it. The Milky Way with its several hundreds of billion stars is thought to be a relatively flat disc - 100,000 light-year across  - with a central bulge lying in the direction of the constellation Sagittarius (The Archer) and six spiral arms. The Milky Way has most probably also a central bar made of young, bright stars. If we can't take pictures of the Milky Way, we may photograph others galaxies which astronomers think look similar to it. The two galaxies presented here are just two magnificient examples of barred spiral galaxies. One - Messier 83 - is seen face-on, and the other - NGC 4565 - appears edge-on. Together, they give us a nice idea of how the Milky Way may appear from outer space. These images are based on data obtained with the twin FORS1 and FORS2 (FOcal Reducer and Spectrograph) instruments attached to two ESO's 8.2-m Unit Telescopes of the Very Large Telescope Array located on Cerro Paranal. The data were extracted from the ESO Science Archive Facility, which contains approximately 50 Terabytes  of scientific data and is, since April 1, 2005, open to the worldwide community. These invaluable data have already led to the publication of more than 1000 scientific papers. They also contains many nice examples of beautiful astronomical objects which could be the theme of as many midsummer's dreams. 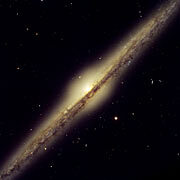 The first galaxy pictured here is NGC 4565 , which for obvious reasons is also called the Needle Galaxy. First spotted in 1785 by Uranus' discoverer, Sir William Herschel (1738-1822), this is one of the most famous example of an edge-on spiral galaxy and is located some 30 million light-years away in the constellation Coma Berenices (Berenice's Hair). It displays a bright yellowish central bulge that juts out above most impressive dust lanes. If our Milky Way were to resemble this one, we certainly would be proud of our home! 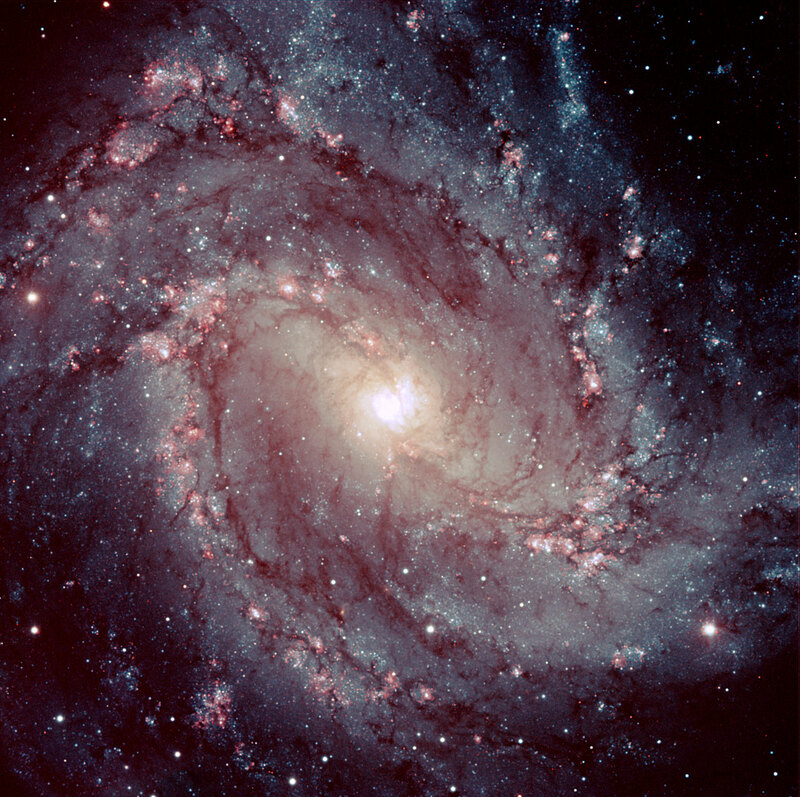 The beautiful spiral galaxy Messier 83  is located in the southern constellation Hydra (the Water Snake) and is also known as NGC 5236 and as the Southern Pinwheel galaxy. Its distance is about 15 million light-years. Being about twice as small as the Milky Way, its size on the sky is 11x10 arcmin2. The image show clumpy, well-defined spiral arms that are rich in young stars, while the disc reveals a complex system of intricate dust lanes. This galaxy is known to be a site of vigorous star formation. A light-year is the distance that light travels in a vacuum in a year - about 9.46 million million kilometres. 1 Terabyte = 1012 byte = 1000 Gigabyte = 1 million million byte. French astronomer and comet hunter Charles Messier (1730-1817) is the author of world famous "Catalog of Nebulae and Star Clusters" containing more than 100 objects. Technical information: ESO Press Photos eso0525a and eso0525b are based on data obtained by FORS1 and FORS2 at the VLT. They were extracted from the ESO Science Archive and further processed by Henri Boffin (ESO). These photos are based on exposures made through four optical filters. For ESO Press Photo eso0525a, these were B, V, R and I. For ESO Press Photo eso0525b, the broad-band filters B, I and R were used together with a narrow optical filter that isolates light emitted by hydrogen in the red H-alpha spectral line. 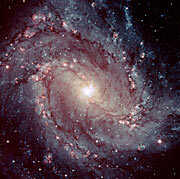 It shows predominantly star-forming regions and other emission nebulae, most of which are located along the spiral arms. The field size is about 7 x 7 arcmin2.